Tebowing! Remember those days, before the Linsanity smacked us all upside the head? Man, that was a fun time, what with all the kneeling and praying, sometimes near mountains, in utero, or on embarrassing holiday photos. But how much do we really know about Tebowing? More to the point, did we ever stop and ask where it came from? When did it truly come to fruition? Who was Tebow Zero? Thanks to tipster Jeff B., I think we all might be able to sleep better at night, or at least watch our Sunday afternoon football with a clearer conscience. I'll let him steer this ride. I saw the weirdest thing tonight. We rented a movie from 1987, Can't Buy Me Love. 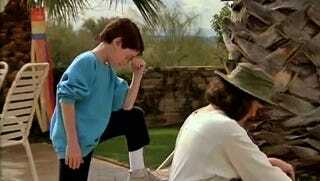 What caught my eye was a split second frame of a young Seth Green striking a familiar pose (attached). I thought, maybe it was the same year Tebow was born? OK, Jeff, now you're just messing with us. What in the world would even possess a rational person to think up such a question at a time like this? That's like a paleontologist unearthing the jawbone of a heretofore undiscovered super-dinosaur beneath the sub-Saharan plains and the first words out of his mouth are, "I MUST KNOW HOW OLD IT IS, JENKINS. GET ME MY CARBON DATING TOOLS." But fine, we'll do this your way. It's your tip. That'd be pretty weird right? You're goddamn right it'd be weird. Of course, I'm completely weirded out by the oddest things, like randomly realizing that a famous athlete is five or 10 years younger than me. That stuff blows my mind. Makes me think about what I've done with my life and what could've been had things went in a different direction. But as for you, Jeff B., I'm not sure I like where we're going with this. I have a weak heart, you should know. Cripes, man. Out with it already! HE WAS BORN THE EXACT SAME DAY THIS MOVIE CAME OUT!!! And so now we know the truth. Thank you Seth Green for bringing the world such an enduring meme, 24 years before we knew what we truly had. Thank you screenwriter Michael Swerdlick for giving Green the material to pull off such an iconic gesture. (I doubt there are any other pop culture gems hidden in those three straight-to-video Olsen Twins movies you later wrote, but let me know I'm missing the mark here.) Thank you Tim Tebow for being born that day. And thank you Jeff B. You've earned your Sleuth badge today, sir.